Home → Articles → Does franchising change when you’re taking on franchisees from other states or countries? Expanding interstate or internationally definitely has different requirements which need to be accommodated. There are a number of things to think about and it definitely helps to be open-minded and flexible to change. Read on to learn more about taking franchisees from other states or countries. First of all, as you expand to this level it is likely your franchise structure will need to expand to include another level — the Master Franchise. You will need to add someone in each state or country to take on the role of franchisor and all the responsibilities for support and franchise management. New agreements and new budgets will be required to take this new level of management into account. It will be expensive and can be tricky. Second, you will have to be open to change. Even in Australia, experience has shown me that you cannot take a franchise from one state to another without being aware of the different culture. Yes, Melbourne is different to Perth and you probably do need a local area manager or franchisor to look after the new outlets as they expand from city to city. Obviously, the differences will be greater with expansion to other countries. Australia is littered with examples of American franchises, which have struggled or not succeeded here because they were not adjusted to meet local tastes. Domino’s were examples in their early days as well as Krispy Kreme and Starbucks. Subway outlet, one for the classic international Subway offering and another with just vegetarian food to cater for the many who do not eat meat and who want food which is more Indian in character. Subway would not have worked in that continent without this more flexible approach. Third, make sure important rules are not disregarded. Especially if you’re opening your franchise internationally. Subway overlooked some fundamental lessons learned in America for more easily expanding a franchise chain. Fred DeLuca, when he opened Subway many years ago, discovered that if he opened a suite of franchises one after the other with overlapping boundaries, each new outlet was more successful because there was already brand recognition from the outlets opened first. We call this the Olympic rings approach to territory expansion. This process was ignored when they sold the master franchise to Australia. The master franchisee, not understanding the impact, opened three outlets simultaneously, one in Perth, one in Melbourne and one in Brisbane, thousands of kilometers apart. Needless to say, each outlet collapsed because they were fighting an uphill battle bringing in an unknown brand. The franchises were bought back and Subway sent in corporate staff to open the brand in Australia. They started in one city and used the well-tried overlapping Olympic rings territory concept spreading slowly through the country. Look at where they are today. 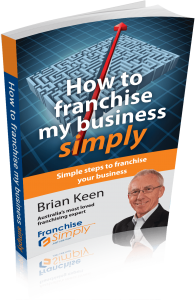 If you want to learn more about franchising your business, go to https://franchisesimply.com.au/ and get a copy of my latest book, How to franchise my business simply and perhaps organise to have a chat with me or one of my expert team.